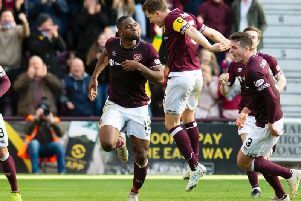 Uche Ikpeazu was the star of the show as Hearts came from behind to beat Aberdeen at Tynecastle on Saturday and can lead the team to glory, writes Joel Sked. Andrew Considine was the first to try but he missed the ball completely. Then Scott McKenna came across to help out his team mate, but he too was left looking foolish. Both chased back helplessly and watched as Uche Ikpeazu ran through and fired past Joe Lewis. Off the striker went, over to the bench to celebrate. He made sure they knew who was boss. Then he told the fans. The final act of his pointed celebration was to the Aberdeen bench. It was his first league goal in 218 days. And boy did he enjoy it. Seconds later, however, concern spread around Tynecastle as fans were still rejoicing over taking the lead. The big Englishman hit the turf hard after clashing heads with Aberdeen's Dom Ball. Dazed, Ikpeazu had to leave the field before being taken away on a stretcher by ambulance staff. Craig Levein admitted he was unsure if the player would be available for the crucial upcoming games. Rangers on Wednesday, Hibs on Saturday and the Scottish Cup semi final a week later against Inverness Caledonian Thistle. If concussed he would likely miss the two league games and possibly the trip to Hampden Park. Yet, Hearts fans were rejoicing once more on Saturday evening when the player took to Instagram to tell fans he was 'OK'. He has to be if Hearts are to have a successful end to the season. Against the Dons he was omnipresent in everything that was good about the team, aggressive and determined. In the first half he cut an isolated figure; a lack of support as Hearts were pinned deep saw him battle manfully against Considine and McKenna. Not only was he isolated but frustrated. Time and again he fell to the ground under a challenge from one of the centre-backs but it was met by indifference from referee John Beaton much to the ire of the home support. Levein too was angered, once again saying to the press that his striker gets penalised for being too strong. He was still a threat, carving out Hearts' best opportunity by himself with his tireless work which is appreciated by the Tynecastle support. 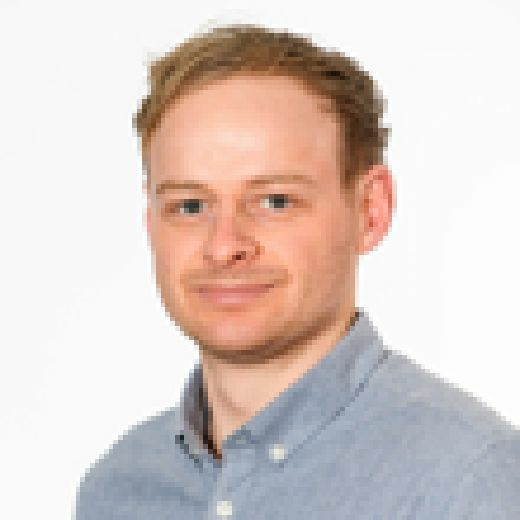 Yet, despite all his valiant efforts, his running, his work rate, the figurehead in attack, the out ball, he needs to score goals, especially without top scorer Steven Naismith. It's not for the want of trying. Often that is his downfall, he tries too hard to score, takes on too much responsibility, tries to do too much. Then the perfect chance presented itself as the ball fell to him at the edge of the box, an open goal. But all he could do was pass the ball wide of the target. Moments later he was booked for diving after going down following a challenge from Lewis. A decision which left him incensed. You begun to wonder but Hearts needed him to rise to the occasion. And he did, in the 77th minute. He will have to continue to do so. Against Rangers, against Hibs, against Inverness. Uche frightens teams. A man of his size shouldn't be able to move at the speed he does. He can resemble the boulder in Indiana Jones, but nimble and more often than not he crushes those in front of him. The prospect of going up against Hibs' Darren McGregor is mouthwatering. He gives Hearts an out. In games where they aren't playing well, a hopeful ball into the final third can be turned into a goal out of nothing, just like against Aberdeen. Uche's fitness is paramount for the rest of the season. Without him and Steven Naismith Hearts can be ordinary. The striker can provide the extraordinary.